Wow... we've moved all the way to 2017... so much has happened... different animals have come and gone... but I always love looking back at our memories as we embark on new memories each day. We have two grandchildren to help us around the farm and another one on the way. Zan and Jessie are still up to mischief...escaping out of the fence from time to time... and we still have a few goats. The coyotes and other bandits have been rough on our birds... we are down to just a few chickens for an egg or two. The garden is planted once again... and we are looking forward to summer coming and fresh veggies again. I really need to come on to the website and begin a new page for a new era. Thanks for stopping by and taking a look through our memories! We are still enjoying life the Good Lord has blessed us with. Family is important... and we love sharing with them. 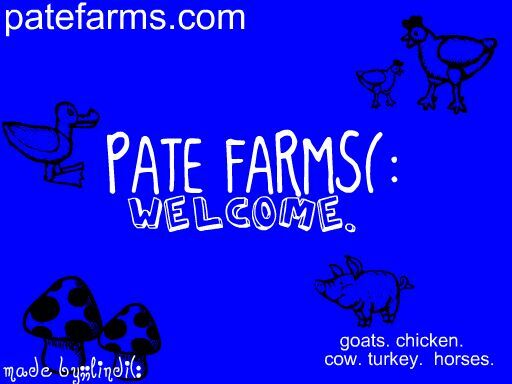 Here are a few pictures of things going on around the farm as well as some of the animals..We'll try to add some pictures from time to time...so pop by to see what all is going on at Pate Farms. Wow... Another year had gone by already. We are still waiting on little Nugget to arrive. January has brought the Coyote back to the farm. Keeping and ear and an eye out on his visits. Hope everyone is well.... we are just waiting for spring! Christmas was great... the best part was spending some time with all of our kids around! Familytime is the best time. Wow... Time is flying... It's nearly Thanksgiving time again! We are getting ready to cook Thanksgiving dinner. I'm excited that Carole and Clay will both be able to join us this year... Can't wait til our little "Nugget...Anna" gets here in January...having a little one around again will certainly spice up the holidays. (Yes, Carole is having a little one :) . Anyone... family and friends who want to join us for Thanksgiving... you are welcome to...just bring a covered dish.... You are welcome to join us! We'll have the main fixings... or at least something good out of the freezer. Just visiting and seeing each other for a little while in this fast paced world will be the treat! Then the pigs followed suit and escaped as well... the dug up my turnip (greens) bed... and I had to replant... We BBQed 2 for Gran's 70th birthday... but the others got out a week or so later... I'm glad I didn't end up on utube with a video of me chasing them in the dark...boy was I ever glad that Richie came home and helped me get them all back into the pen...(greens saved at least until the next time they break the compound!) Hope they will be big enough for Thanksgiving....(the greens). We are planning on keeping Christmas simple this year... we want to get together with family dinners and celebrate through our worship at church of our Savior's birth... but forgo most of the gifting season this year... Maybe we can just have a fun game night...or something to spend time together. Isn't time with one another one of the nicest gifts anyway! Hope all is well for everyone.... take a little time to slow down in this hustle bustle... we call life... take care everyone! June 22, 2010 ... Wow, time flies when you are having fun. This past year has flown by. Here's a few updates on the farm. The fox and coyotes really cleaned out the birdies during the winter. I really miss my turkeys following me around the farm...GP and the Three Amigos all were fox dinner during the cooler months. We have some new babies I ordered and one Blue Slate hen sitting on some eggs in a pen (all the others who made their nest out around the farm were eaten..;( ) We still have two peacocks who are roaming around the farm. They've just lost their long tail feathers and the one pea hen (Belle) is still here, although she didn't hatch her nest she tried to put on top of the shop to keep safe. It's just been a bad year for the birdies. The two new calfs, Taco and Fajita, are eating grub now and have moved over to their own pasture, next to the piggies. The piggies are getting huge! They really love a good bucket of slop too. They are quite the escape artists and it seems we are always working on their pen. We trimmed the goat herd down. We've just got to work on fences and pastures. There is never enough time or money it seems. The youngest goat is "Little Billy". He is growing fast and is so fun to watch as he taunts the little lambs. Yes, we had two little lamb rams this spring. They are now ready to sell too. Any one interested in lambchops? The horses want me to work on the fence so they can get out and graze...It's on the list horsey friends. The deer ate the peas, and bean plants, along with the okra as soon as it sprouted up good this year. However, (knock on wood) they haven't found the corn as of yet. I saw a great big fat deer in the garden yesterday when I picked a small bucket of really small tomatoes....hum... maybe no peas this winter...but a nice big fat deer roast??? She just stood and looked at me as I lectured her about eating up my garden....then walked serenly over to the woods and out of sight... and I picked the maters. The back porch is ready! Yay! and Richie made the steps last night. We still need to add the railing and do some clean up work.... and a couple of ceiling fans... But It's so nice to have another porch! Well....that should get you a little updated on the goings on here... I really do need to work on the website some in July...(lol)..
August 22....Summer has been hot and humid. We had a call to go remove a bee hive this week. It was an easy removal and we were glad to get a new hive of bees. They had taken residence in a screech owl box...so Richie carefully removed it and brought it home...take a look on the bee page or the blog for pics. It's a beautiful day...hope you are enjoying it as much as we are! 6/10 The Harris County 4-H summer activity group came to visit the farm this morning...pictures are posted on the events page...They include a walk through the garden...to see what all is growing. 2/16 Big Blue is busy at work moving mulch into the big garden. Friends have decided to partner with us for some summer veggies...so we worked on the small garden, and planted early peas and potatoes for some spring treats. The kids have all been riding horses and we've been enjoying a break from the winter weather. Honestly...we can't wait until spring. As things pick up, there'll be less time to blog and update the website...but take a peak now and then to find out what we're up to here on the farm! Pick out a spot in your back yard that will be in the bright summer sun and make a bed to plant in early spring. Start planning now...A small raised bed could give you much pleasure for only a little work...smell the earth...feel the richness...share the joy with our children. We've seen what has happened with the big industry, the big banks, the big auto makers, ....doing a little backyard gardening could help preserve a lost art for our children! The Home Page has been getting a little lengthy so we are archiving it...so if you feel like browsing...you can do so under Fall Archive2008, or Summer Postings 2008. Also, please remember to check the blog. We'll do most of our writing there on the happenings at the farm. 12/2 We put the Thanksgiving photos and the Land Christmas 12/7 photos on the events page. 11/24 We are getting ready for the Thanksgiving get together. Here is the initial list. 8/30 ... Mushrooms are everywhere...new guinea keets have hatched.. We've got two new bunny rabbits on the farm..
8/23 We've been doing most of our postings on the blog. 7/22/08 Lauren came over for a visit today. She wanted to learn how to make homemade biscuits. Click here to see more pictures about her biscuit making adventure. Midnight delivers two strong little billies...Claybo and Buster June 26 about 10:30. Lindi is learning how to sew! We have been hard at work building the peafowl pen. April had her baby on May 16, 2008. Welcom to the farm Mr. Socks! Clay takes a moment out to relax in the swing by the pool and garden and read a book. Ginger has collected and cleaned this pile of eggs. It is about three days worth of eggs!!!! Those ladies sure have been busy. Ginger heading off on a nice ride.... Gotta get that saddle ready! Items for sale updated 4/5/17 Click on any picture on website for a larger view. How many hens are setting? check out the poultry page and see if you can find some setters?